Diet Sabya a page that calls out celebrities for copying outfits and recently trolled Divyanka Tripathi for copying a Sabyasachi belt. Well After her, Diet Sabya took a case on Hina Khan for wearing a pink dress which was actually a copy of an International designer, The House of CB. Well, Hina is not the ones to hear anything, she gave it back to Diet Sabya during a LIVE video chat where her boyfriend Rocky Jaiswal was also present. From criticising it as 'diet chira' to explaining the difference between copying and taking inspiration from, the actress explained her point that these trolls are nothing but 'jobless'. She has started #InspirationIsAdmirable and Hina's fans have been constantly sharing pictures where they have taken inspiration form Hina to look gorgeous just like her. Not only Hina's fans, Priyank Sharma, her Bigg Boss 11 buddy also came out in support of her. Check out Hina's post and Priyank's status here... Now, what are your views regarding this do Comment and tell us also don’t forget to subscribe to India Forums, Addiction at its best. 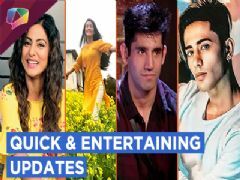 User Comments on video titled "Hina Khan Takes Diet Sabyas Case | Priyank Sharma Supports"